The Shan Project School of Biblical Studies (SBS) is an inductive Bible study training program. It is a part of the School of Biblical Studies International and Youth With A Mission, in partnership with local communities within the Golden Triangle. Initiated by local Shan believers with a hunger for God’s Word, our School of Biblical Studies is a unique partnership that is developing a group of local Trainers of Trainers in Inductive Bible Study through all 66 books of the Bible. It is specifically designed to be a reproducible model that will equip and release the next generation of local leaders to strengthen their communities from within in the Golden Triangle region. The Bible has the capacity to revolutionize lives, communities and society with real change and lasting hope and development. Become part of starting a movement of transformation. Why Inductive Bible Study Training? Inductive Bible Study is a fantastic tool to use to studying the scriptures. Using the three simple steps of observation, interpretation and application, people are equipped for a life time of Bible study. It does not require a vast library, internet connections, or higher education, not even a PhD in Theology! What it does do, is it teaches people how to listen to the Scriptures through the mindset of the original audience and to apply the truths of God's word to their needs and lives. The Bible is key in the formation of worldview and in the transformation of lives, communities and society. We are building capacity into communities by developing the next generation of leaders within the Golden Triangle. What to expect during the SBS training? During the participants time in the SBS they will get training like no other, as they are immersed into a holistic learning experience, within a small community setting. Each person will receive regular coaching and encouragement to grow and mature as part of their personal development. Participants are taught think critically and independently as they work. They will also receive an education in ancient world history, learning about different types of literature. As they are immersed in a multi-cultural environment where they will improve their linguistic skill. Participants are taught studying techniques and time management skills and they are challenged to look at worldview which is the foundational building blocks for future development; personally as well as within family communities and society. The Golden Triangle with it’s endless mist covered mountains, isolated valleys that winding along ancient trade routes where the might Mekong river flows. The Golden Triangle region is spreads over; Northern Thailand, Eastern Burma (Myanmar), Southern China and Northern Laos, but has its heart located in the Eastern Shan States. The Golden Triangle is home to an amazingly diverse number of ethnic minority groups with rich cultural heritages. There are over 130 languages and literally hundreds of different dialects within the region. Despite the Golden Triangles natural beauty, diverse peoples and rich resources. The region has a reputation for being the number one producer of Opium South East Asia. The Shan are one of the largest unreached people groups in the Golden Triangle region. With millions spread throughout South East Asia including Burma (Myanmar), Thailand, China and Laos. As an ethnic minority they struggle daily with illiteracy, human rights abuses, and poverty. Many are refugees with no rights in foreign countries; some are even displaced and persecuted within their own country. Still they are an ancient and proud civilization with a rich heritage and history. It is said, "To be Shan is to be Buddhist" and there are only less than 1% Christians among them. 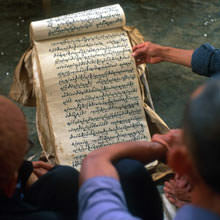 Shan Christians have had the Bible for many years, but most have never fully understood it. They have expressed a great need and hunger to understand God's Word.